When I built my RV-10 panel, there was room for a set of 3 round gauges to use as backup gauges for IFR flying. I had a 2-1/4" round altimeter, an airspeed indicator, and an ADI as a pseudo-attitude indicator. It's a workable setup, although I'm still waiting to replace the ADI with a 2-1/4" round electronic gauge like the RC Allen 2600-2. If only they would be somewhat reasonable about the cost of that instrument. It's very weak on features for the high price they ask for it...around $2600. In the experimental market that thing would be worth $1000 tops, and it would likely include many other EFIS features. I've been waiting 2 years of OSH for someone to come out with a competing product in that 2-1/4" form factor, or for RC Allen to get experimental pricing. The instrument itsel is made for RC Allen by the folks at iLevil. 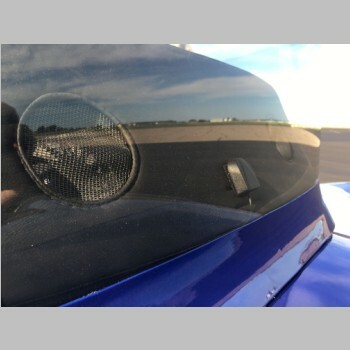 In my RV-14 I wanted to have backup gauges for IFR flight, but there is only enough panel space for me to get an all-in-one 2-1/4" round gauge there, and I wasn't about to even think of spending $2600 on the RC Allen. Fortunately there is a better, more feature filled, and cheaper option available. 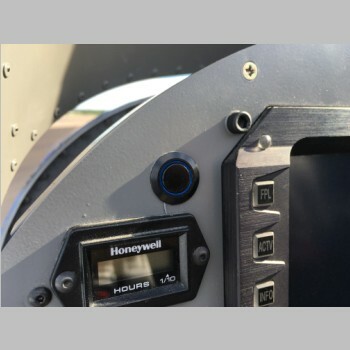 This would also work for me in the RV-10 but I am of the opinion that if you intend to do a lot of IFR flying with the airplane, just throw the gauges in the panel. This option will work well for me, but will require a little pre-planning for the IFR flight. 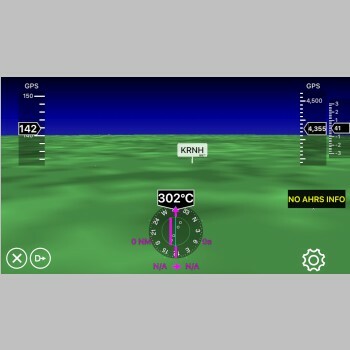 In short, this system on it's own could replace everything but engine gauges for a non-IFR plane, and when paired with the output of an engine monitor it can even display all of your engine instruments. I did not integrate engine instruments on mine because most of the software packages I use now in iPad wouldn't display it anyway, and my engine monitor has it's own screen if my EFIS's (all 3 of them) were to fail. The removable antennas are important to me because I wanted good performance, so I added a Delta Pop Aviation UAT antenna on the belly, and put the GPS antenna on the glareshield. As it turns out, the iLevil will always be running in the background, and it doesn't require me to have my iPad running before flight. Yes, on an IFR flight, I would pre-enter my flight plan and have it all running anyway, and then let the iPad sleep, but it will not require me to do this before each flight. So this one little box takes care of all of my backup instrument needs and more. You may realize that I already had NavWorX ADS-B in/out by using their ADS600-B unit, and I already had ADS-B info to my ipad via wifi from that system as well. That system does work well, but at this point, ipad integration would be unnecessary but is just a backup. I still need the system for ADS-B OUT functionality, and I still use the weather provided by NavWorX for my Chelton EFIS system. The benefit of using the iLevil for ADS-B in for ipad is that it is a dual-channel IN receiver, for both 978Mhz UAT frequency and 1090Mhz ADS-B as well. Yes, I would receive all traffic via ground station in theory, but in practice I don't find that I get every target from every location. Using the iLevil, I will receive direct air-to-air reception of any ADS-B traffic on either frequency, and it will display on the ipad. 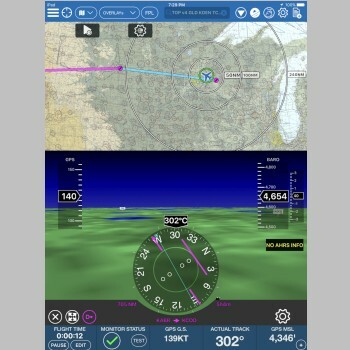 Some day I hope to have dual freq on my NavWorX as well, and I think NavWorX does plan to offer that upgrade in the future, but until then this will help improve my traffic awareness if I choose to use the ipad on a flight. Regarding the apps, since ForeFlight is very pig-headed about their system integration, I can't/don't use this with ForeFlight. While they are not fully-closed and proprietary anymore, they still shake down their integration partners for lots of money if they want to be integrated into foreflight. So with that in mind, I have 3 other Aviation apps. These 3 are great apps to use, each having thier own strengths. 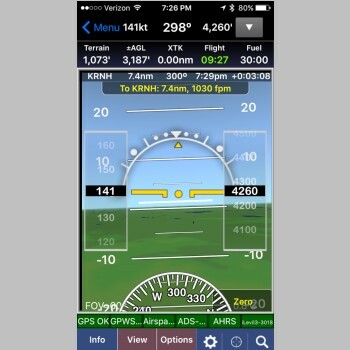 Additionally, ALL THREE apps offer something that ForeFlight doesn't, that really bugs me about ForeFlight. You see, my wife occasionally flies as well. Rarely will we not fly together, but she is a pilot. And my daugther is also taking flying lessons and will be a solo pilot when she turns 16 and an actual pilot at 17. But ForeFlight only allows you to use one iPad, one backup iPad, and one iPhone on an account. This means that I can't have my wife use ForeFlight on her phone at all, nor my daughter. And I get all of that for paying $100/yr. What a ripoff. There's no way I'm paying $75-100 per person to have the foreflight app, when it's all used within my family. Until they get this, and openly integrate with 3rd party ADS-B systems, I can say I've gone as far as I will, with ForeFlight. Check out the other apps...ALL THREE of these can be installed on every iOS device you own. So, I have them on my ipad and phone, my wife's ipad and phone, and same with my daughter. (Note that FlyQ is not available on the iPhone, only their flight planning app is) Now, even if they are just passengers in the plane, they can use ADS-B and watch for traffic or follow our flight. Below I'll show you some install pics and app pics as well. Note that this isn't a full representation of what the apps can do. 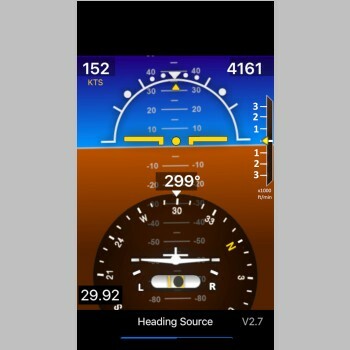 You can set your altimeter on the app and do all sorts of things, but these screenshots were just taken quickly to demonstrate the AHRS and pitot-static integration. Notice the Highway in the sky display! So this backup instrument package is pretty darn complete now, without having to put any instruments in the panel at all. 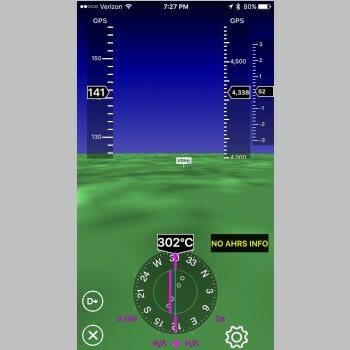 There is simply no excuse anymore in ANY aircraft, to not have ADS-B weather, ADS-B Traffic, GPS, Charts, and backup Attitude information at minimum, and with the iLevil AW3, you can even include pitot static information if you are lucky enouh to fly an experimental and can tap into your pitot static system. The future of the FAA seems to be to allow safety info though, so perhaps with a 337 or thru some other approval, everyone can have this with full pitot static integration. Because I get bored easily, I decided to do some playing with the iLevil integration into my RV-14. There were 2 things I wanted to experiment with. First, I knew that the iLevil provided ipad app allowed for engine monitor integration to GRT's EIS, and I wanted to try that out. Also, my current ADS-B system is 978Mhz receive only, so 1090Mhz traffic has to be relayed from a ground station. The iLevil 3 AW is a dual frequency 978/1090Mhz receive system, and sometimes I see different (sometimes more, but sometimes just different) traffic than the other system. There may be a plane or two of each type that the respective system doesn't see, more often than not it's just missing the 1090Mhz plane 15 miles away. I wanted to be able to see if I could get them both on my Chelton screens. The iLevil was a bit of an unknown because while it does send GDL90 format traffic and weather, it also sends AHRS data at the same time, and it would be important for the Chelton to be able to ignore it. Also, the Chelton requires 38,400 baud for a bitrate. Turns out that is all possible. I tapped into an output connector on screen 3 of my Chelton to grab my engine data and send it on a receive serial line to the iLevil. That worked real simply with one wire...didn't even need a ground because both units use the same ground of the aircraft. Then for traffic, I added a switch to the traffic input pin on my Chelton screen 3, and that allowed me to either use the traffic fed from screen 2, or the iLevil as the traffic source. It ended up working pretty well. 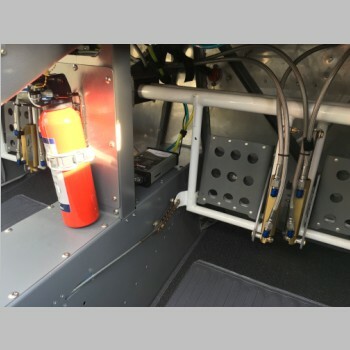 There was one issue in that the iLevil doesn't currently have a way to filter itself out of the traffic feed, so you do see yourself on your EFIS. I talked to them and they will add the ability to filter out your own ICAO code on a future firmware release. The other issue is that while the NavWorX I use filters traffic to a +/- 8000' altitude I believe, the iLevil does not, so I was seeing airliner traffic above me that I would not ever care to see on my EFIS. So it's not perfect but it does give an option for receiving both traffic types. NavWorX was going to do an upgrade from what I heard, to allow dual frequency receive, but I haven't heard that they made any progress on it, and I definitely want that in the end, so if it doesn't come soon I plan to look at the uAvionix Echo UAT and see if that integration offers everything I need. Sometime in the next year I want to have dual frequency traffic receive. I also want satellite weather, as my WSI box may be going obsolete in the RV-10, and that will be a priority fix issue...I need the WSI format, not XM, to work with my EFIS. Regarding configuration of the iLevil for operation, here are some notes I took, mainly posted here for my own memory, but if you can interpret it, it may help you integrate their system for you. First: ONLY use their version 4.77 of TeraTerm. Newer versions of TeraTerm can render your system inop, even if you do everything correctly, due to a bug in the way ymodem works. The first field is Address...i.e. 8, 9, 20, 21, 22, 23 for what you are programming. 8 is the address for Aux0 baud rate. 9 is the address for data type for Aux0. So set Type 0 = Data Out, and 384 = 38,400 baud. Try reading the registers one at a time and verify if registers 9, 21, and 23 are type 0 if you want ADS-B out (GDL-90). Set register 8, 20, and 22 to "384" if you want all at 38,400 baud. If you want to set a port for GRT EIS you can do that with their config tool too. To go to defaults just choose "load defauts"
Install the USB serial driver. Boot up, hit "uuu", then "ppp" for programming mode. The menu then comes up and you hit 1 to program. Turn on and immediately hit "p" (lower case" for programming mode. The menu should show up and hit 1 to program. Send firmware with transmit ymodem, send file, ilevel3.bin. To reset wifi, hit www when it is scrolling.